I was introduced to the Bajracharya medical tradition of Nepal by my colleague Alan Tillotson, author of the highly acclaimed One Earth Herbal Sourcebook. 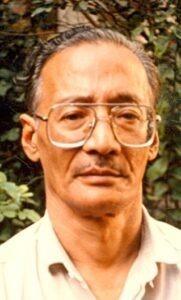 Alan had met the late Dr. Mana Bajra Bajracharya somewhat by chance when he traveled to Nepal in the early 1970s, suffering from the effects of poorly controlled type 1 diabetes. Through Dr. Mana’s skill Alan was restored to health, and since that time, Alan maintained an ongoing relationship with Dr. Mana until his death in 2001. Known locally and internationally for his healing skills, Dr. Mana authored over 40 books on Ayurveda, and in 2000, Alan asked me to help with the publication of these works. In 2009, I finally traveled to Nepal to meet Dr. Mana’s son, Vaidya Madhu, and shortly thereafter we published the first of Dr. Mana’s work as Ayurveda In Nepal. This book is detailed compendium of the traditional theories and practices employed by Dr Mana, drawing from the 800 year old medical tradition that he inherited as part of the Bajracharya lineage. Although Ayurveda is typically thought of as being a Hindu practice, during much of its development it was strongly influenced by Buddhism, and many notable teachers of Ayurveda including Vagbhata (author of the Ashtanga Hrdaya, c. 7th cent CE) and Nagarjuna (author of the Rasaratnakara, c. 10th cent. CE) had a Buddhist orientation. One major center of Buddhist Ayurveda was in Eastern India near modern-day Kolkata (Calcutta), at Nalanda university, which attracted scholars from all over the world. While Nalanda was eventually destroyed by invading forces in the 12th century, its teachings and practices have been maintained ever since by the Bajracharya lineage of Kathmandu, Nepal. On March 8th, join me for a lecture that explores Ayurveda, Buddhism, and the Bajracharya medical tradition of Nepal, drawing from the work of Vaidya Mana Bajra Bajracharya. At the end of the lecture, I will discuss an opportunity to visit the Kathmandu valley in early 2017, to study the tradition and practices of Ayurveda in Nepal.